In 1945, rising prosperity and war's end were sending Americans to the movies in record numbers. As a result, Hollywood underwent a growing demand for what they would call "product". 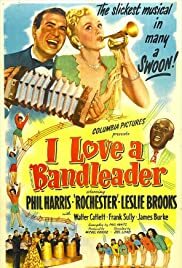 That's likely why career second banana (The Jack Benny Show) Phil Harris got the lead in this minor Columbia musical, along with the more seasoned Eddie "Rochester" Anderson, also from the Benny show. Together, they bring a lot of bounce and style to a string of undistinguished musical numbers. Harris is no singer, but he does talk a good tune, especially his signature rendition of "That's What I like About the South". Brooks nicely warbles, or at least lip-synchs, a couple of forgettable numbers, while Anderson entertains humorously as Newton B. Newton, bodyguard and agent extraordinaire. And that's about it, except for the slender plot, which unfortunately becomes too heavy during the last third, bringing down the former verve and uplift. In fact, this may be the only movie musical, major or minor, not to end the proceedings with a bang-up production number. Oddly, the ending is more like the producers suddenly ran out of film or script or something. In passing-- James Burke was a familiar face from that era, usually as a cop or slightly dense official of some type. Here he plays Charles Gibley, owner of the nightclub. Watch him tilt back his head and deliver a withering squinty-eyed stare at any and all who are trying to hustle him. It's really a priceless bit of business. There were many of these distinctive "types" like Burke who performed unforgettably over the years, but whose names were generally unknown and their passings generally unnoticed. God bless them all.